Clay and I are sitting at the doctor’s office waiting on blood work results and this is literally the first time since Friday that I’ve had a chance to update this blog. I wish I had more time to update you with the things the Lord has been showing me during the tragedy we are living in, but I’ll have to be very short and sweet for now. First, our house did not flood. We were trapped in the neighborhood from Friday evening to Tuesday at noon but we didn’t get water. It was literally all around us but the hedge of protection around our home proved true! Thank you, Jesus! The above pic is Clay sitting on our neighbors front yard looking at the neighborhood he grew up in completely under water. Our house backs up to this yard. We were able to take in neighbors who flooded and my cousin who flooded. Praise God we had enough food for 16 people and 3 dogs for several days. Clay’s office is a total loss, which is insignificant in light of all the other loss. My parent’s house had 18″ of water, my grandmother lost everything to 5′ of water, their precious gift shop in Denham had a foot of water, my aunt and cousin had losses, too. The devastation is all around us. We’ve been working and cleaning for days and our house has become a shelter for my family. So, in the midst of chaos, we are sitting in the Oncology office surrounded by people fighting cancer. Their fight goes on, even in the midst of the floods. It gives me a very different perspective on the situation. Clay’s symptoms have been bad the past week. He started having pressure headaches on Friday and he has been very confused. He describes it like he is in a fog constantly. Dr. Russell started him on steroids because he thinks Clay is experiencing some swelling from the radiation which is making the symptoms so bad. We got to visit with Dr. Russell today and it made me feel much better. He said he’s not worried about Clay working in the mold and bacteria infested houses and he thinks the symptoms will improve over the next month. The MRI is scheduled for Sept 8 at 10 am. We will review the results with him immediately. That MRI will tell us a lot. I’m relieved to know it is scheduled and we have plenty to distract us while we wait for the 8th to arrive. We picked up Clay’s signed mask, which I think I’ll hang in a very promonant place for a while. It’s a great reminder of God’s goodness. Thank you for your concern and your love. Pray for Louisiana and our impacted family members. God is at work and I believe He is proving Himself to us right now. Shine bright and let His glory be revealed through your lives right now. These moments of trial are our greatest opportunity to show the world the power of our God! If God loves us so much, why doesn’t He answer every prayer? Why doesn’t everyone who prays for healing get healed? Why do some prayers get answered when others don’t? I’ve waited to write this post because I’ve been waiting on the Lord to help me understand completely. I could articulate in my own words how I felt about these questions, but it wasn’t until yesterday that the Lord really spoke to me and showed me in His Word how He feels. So, my prayer in sharing these very deep, raw thoughts with you, is that in some way it will help you if you are currently praying for God to do something in your life. Or, if you are dealing with the aftermath of an unanswered prayer. From the minute Clay was diagnosed with Glioblastoma and the doctors in Baton Rouge told us they couldn’t help us, God has given both of us the same thoughts. It’s kind of strange, because you would think that the first thing we would pray would be a plea for healing. The first thing we both prayed was “God, be glorified in our lives and in our situation. No matter what happens, just receive your glory.” Don’t you dare think to yourself that there is anything special about us. That was God. Not Clay. Not Kristy. It was God. It was very supernatural. And, I’ll tell you that I will never forget it. I will never forget that, just hours after the doctor said, “You have about 4 months to live,” our hospital room was filled with 20 people and the Holy Spirit came over me and prayed through me like never before. It was truly supernatural. And that prayer was not a prayer for healing. God was speaking to me about what He was doing. The prayer was for our faith to remain strong. For us to be steadfast. For us to trust God no matter what. For God to give us endurance. I rebuked Satan and his attempt to destroy our faith and prayed that God would not allow him to take one single thing from us or our testimony. The prayer was for God to keep us from sin, and pride, and anything that would separate us from Him during this time. I honestly can’t remember if I even asked God to heal Clay. I think I remember telling God that I believe He can…with all my heart. That our hope is sure and we know He is able. But, our desire is for His will to be done. How does this happen? Because God truly prepared us for that moment. For years leading up to that day, God was preparing us. He was teaching us lessons that we didn’t understand until that moment. It all became crystal clear. And, because the preparation was done, He just lived through us and did everything. We didn’t even have to think. God literally did everything. Because we all have needs that we are asking God to meet. We all have desires that we are praying for God to fulfill. But, what happens to our faith when He doesn’t answer the way we want? How can we keep ourselves from becoming angry at Him for not doing it the way we thought He should? That is the answer. Don’t allow yourself to put God in a box. Don’t set God up for failure by telling Him what He should do. Submit yourself to Him and His will. And let Him decide what is best. I’ve told you before about what the Lord showed me from Job while I was teaching the Ladies’ Retreat for our church just a few days before Clay got diagnosed. We think of Job as a hero. As a righteous man who endured tremendous suffering and never cursed God. And, those things are true. Job withstood a greater test than any of us have ever known. God offered Him to be tested and Satan came in full force. Through it all, Job never cursed God. He never turned against God. So, guess what? God answers him and shows up. He comes in a whirlwind. Oh my goodness. Can you imagine??? Sitting on a heap of ashes, in a field, and God showing up in a whirlwind. And, by the way, showing up because you yelled up at the heavens and basically demanded that He come? I can not even imagine what Job’s face must have looked like. Then, God says, “Brace yourself.” Whoa. I never want to hear God say those words. And, God proceeds to prove to Job just how powerful He is. He says, “Where were you when I formed the earth?” I mean, what else does He have to say?? But, He goes on…and on….and on….and Job just has to listen as God tells him all the great and wonderful things He has done. What is the point? The point is that Job endured what God allowed Satan to do to him to test him. He believed God to the very end. But, God had to show up in order to humble Job. And, in His mercy, He did show up. He humbled Job. And, then He was able to bless him and restore everything that was taken away. I do not want to be filled with pride. No matter what happens to me. No matter what Satan does to test me. I don’t ever want to be filled with enough pride that I would demand an audience with God to plead my case. I want to have a heart that is humble and trusts God’s plan for my life, no matter what. Where was I when He formed the earth? Nowhere. I was nowhere. I was nothing. He is everything. He is the creator. That means that He has already seen the end. He is the End. So, wouldn’t that mean that He knows what needs to happen to get us there? Let’s say that God had come to Job and said, “Job, I want to allow Satan to tempt you and he is going to take everything away from you and you will end up covered in boils on a heap of ashes. Is that ok with you?” What do you think Job would have said? I don’t know. But, based on the way he demanded the opportunity to plead his case with God, I would imagine he would have asked God to consider another alternative for his life. But, what if God wouldn’t have allowed Job’s situation to happen? Do you know how much information is gleaned from the book of Job? Do you know how many lives have been impacted and changed because of Job’s story? Think of the impact Job’s story had on the history of the world. What would Job have said to that? I don’t know, but I think he probably would have said, “Yes.” I would hope he would say yes. I would hope that I could say yes. Isn’t that really what He did? God allowed some hardship for a short time, but in the end, God’s power was revealed, His majesty was displayed, lives have been changed, and Job is one of the most famous men to ever live. God is using his story thousands of years later. God sees what we can not see. He knew…when Satan came to Him and thought he was so smart…God knew the end of the story. Satan didn’t. But, God did. He even knew that I would be typing this blog about Job and that the story of Job would be speaking to me in 2016 about my current situation. He knew all that. Thank goodness He doesn’t always give us a choice, because Job may have said no. And, then where would we be? We wouldn’t have his testimony to help us today. We have to trust God that everything He is doing is for a reason and that the purpose will be revealed when we are with Him in Heaven. And, we have to realize that our lives are but a vapor. Everything that happens on earth is affecting eternity. Our lives are not about what we see, they are about what we can’t see. So, where is the line between a strong faith that will stand firm and believe God for a miracle, and a heart that trusts and believes God to do whatever He wants? I have struggled with this question more than any other thing since May 2. I am so afraid that I will just accept the diagnosis and let Clay die, rather than standing on the Word of God and having a faith that is strong enough to pray for His healing and persuade God to do it. But, I don’t want to step out and claim something that God isn’t telling me to do. I want His will to be done. Our Pastor, Lee Shipp, showed us something really remarkable. Do you know the story of Hezekiah? He was a king of Israel. Isaiah comes to him one day and tells him that God has spoken. Hezekiah is sick and about to die. Isaiah tells him to get his affairs in order. Then, Hezekiah falls on his face and prays. He pleads with God to save his life. He reminds God that he has been a righteous king and has always tried to do what was pleasing to God. So, God changes His mind and spares Hezekiah’s life. Now, I have read this story a lot. I have even taught about this story and how we need to have the kind of prayer life that can affect God. I’ve contemplated what I would need to do in order to have such a strong prayer life that I could actually change God’s mind. But, look what happens. The story is told in both II Kings 20 and II Chronicles 32. You have to read in both places to get the full picture. This is the real point…. Rather than respond with love and thankfulness, God healed the man and he grew proud in his heart. And, because of his response, he caused the anger of God to burn against all of Israel, including his own family. If you keep reading, you will see that his sons became corrupt and were evil. All of this evil happened because he didn’t submit to God’s will. What would have happened if Hezekiah would have just gotten his affairs in order and allowed God to carry out His plan? Maybe God could have blessed Israel. Maybe his sons would have been righteous kings. Maybe. We’ll never know. But this we can know. We would never want to do that. Right? I would never want to ask God to change His mind and allow me more time on this earth, if it meant that my heart wouldn’t be right and it would cause curses and pain to others. Please don’t think I am saying that Clay wouldn’t respond correctly to a healing. I trust the work God has done in his life and I do not believe that he would respond that way. However, even Clay would tell you that he would never want to stay here on earth if God wanted to take him home. If there is something that God needs to accomplish through Clay’s death, then Clay is submitted to that. Hezekiah’s story is an illustration. God is telling us to trust His plan. He is saying that we should be willing to submit to His plan, no matter the cost. Then, why wouldn’t we just always pray, “God, let your will be done.” Why would we ever ask for a specific outcome? Where does the prayer of faith come in? This is what God showed me yesterday while I was reading on the beach. John 15 is a very famous passage of scripture. Jesus says that He is the vine and we are the branches. He tells us to abide in Him. You know it. If you don’t, stop and read verses 1 – 10. Ok. Sounds easy enough, right? Abide in Him. Let His Word abide in you. Ask and He’ll do it. In the original text, the word used here for ‘words’ is “rhema.” It means that His Rhema Word must abide in you in order for you to ask what you will and have it done unto you. The translation for “rhema” is “That which is uttered by the living voice, a thing spoken.” A rhema word from God is an inspired thought or interpretation of scripture in which the Holy Spirit speaks a specific, timely word to a person. This means that as we read the Bible, the Holy Spirit can use the words of the Bible to speak to us regarding specific situations in our present lives. This happens all the time. You read a scripture you’ve read hundreds of times before, but suddenly one day, it takes on a whole new meaning. Or, the Holy Spirit reveals a truth to you that you’ve never seen before. So that scripture (John 15:7) is referring to His Rhema Word. Not just the Bible. The inspired interpretation of the Bible, inspired by the Holy Spirit for your current situation. It is a living, spoken Word from God. That’s why we need the Rhema Word. We need the Holy Spirit to speak to us and reveal God’s plan so that we know how to pray. Then, when we abide in Him, and His Rhema Word abides in us, we will ask Him to do what He has revealed as His will and He will do it. This is not God’s way of telling us that we can have whatever we want. He is saying that if we abide in Him and seek His Rhema Word, then our prayers will align with His will and it will be done. I have been praying, since May 2, for God to reveal His will for our circumstance. My greatest desire is for His will to be done, but I want to know what His will is, so I know how to pray. If He tells me that He wants to heal Clay, then I will have the faith and confidence to stand and believe Him to do it. But, He hasn’t told me that. I believe that He can….with all my heart. I have no doubt. I remember one night at our prayer meeting at church. We were preparing to leave for our first trip to MD Anderson. We had no idea what was waiting for us there. Our church family was so shaken by our diagnosis and God had really caused them to pray so hard for us. We were in the altar, completely surrounded by people. There were so many tears and so many people crying out to God on our behalf. I remember feeling like I was literally floating because the prayers were so strong. I was on the floor kneeling in front of Clay and holding his hands. When we finished praying, I looked at him with an anticipation. I wondered if I would look and see that God had healed him right there. I mean, there’s no way we could have prayed any harder. But, I knew in my spirit that it wasn’t done. I looked in his eyes and I knew there was no change. He wasn’t healed. In my spirit, I was hurting for all these sweet, Godly people that God had surrounded us with. I was scared that their faith would be damaged. They were believing God so much and begging Him to do this miracle and I knew that Satan would try his best to damage their faith. Just as I was thinking these thoughts, our Pastor walked to the microphone and spent 10 minutes warning the entire church, in love, to guard our hearts. Although we have faith and believe that God can do this, we must be careful not to put Him in a box and only believe Him if He does what we ask. We must trust that His will is best. I wouldn’t have known how to say what my Pastor said. But, he knew. And, he said it with such wisdom and love. He squashed anything Satan could have tried to do that night. This is why our blog slogan is “Live or Die, we will praise you!” Because we just want God’s will and we trust that He will do what is best. I know this was long, but each thought was needed in order to make the point of what God has been saying to me. I pray that it helps you if you are currently asking Him for a miracle. Or, if you are dealing with the fact that He hasn’t answered your prayers. Trust Him. Ask Him to reveal His will so you will know how to pray. Ask Him for a Rhema Word, so you will know what He wants to do. Don’t put Him in a box with your expectations. Believe that He is able, no matter what your current circumstance shows. Just believe Him. And, remember….He sees what we can not see. Let His will be done. Amen. Thursday was Clay’s last treatment! He has been radiated 30 times in 6 short weeks and he took 42 chemo pills. The doctors did everything in their power to attack Clay’s tumor with the best medicine available. But, we know who is in control. We know that God’s plan will unfold. He has greatly used these doctors and technicians to make a difference in our lives and we are forever grateful to them. I feel like we’ve gained a whole new family in this process. Here are a few of the magnificent people at Pennington. From right to left – Cathy, Natalie, Brittny (I think I spelled this right??) Raymond, and Mary. I will never forget these faces, and several others that are not pictured. From the minute we walked into the clinic on that Friday afternoon, when our plans had gotten crushed the day before, we have felt at home. We loved Dr. Russell the minute we laid eyes on him. We just knew that he was the doctor God had chosen for us. Well, Dr. Gummadi actually selected him, but we knew God told Dr. Gummdi what to do. Ha! Speaking of Dr. Gummadi, he was working at the Bluebonnet hospital on Thursday and he came down to see Clay just before his last treatment. I’ll write another blog post one day just about the Gummadi’s. God used them in the most amazing way in our lives during this time. It is another very cool story that will give you goosebumps. Let me back up just a little bit….I skipped the most important part – the food! We had a little pre-treatment celebration over lunch at Randy Montalbano’s seafood. My mom and dad met us there because it is one of Clay’s favorite places to eat. If you have never been, you have to try it. The food was especially good that day…maybe because our son was the chef. Sam had to work, so he got to visit with us while we ate, but he couldn’t come to the treatment with us. Emily and I managed to convince him to take a selfie with us so we could remember that he was there for a while. Thank you, Diane, for treating us to this lunch. We had a great time being together. When we arrived at Pennington, Clay’s mom was waiting for us. Clay’s parents have both had cancer, so they are familiar with this process. However, I can see how it would be completely different to watch your son walk through it. As a parent, we always want to take the difficulties from our kids, so I know that Clay’s parents would rather this be them. But, we are all trusting in God’s plan and believing that He knows what is best. This is Clay with his mom. Sweet. We got to the treatment center early and they took us in because they had some room in the schedule. Our parents got to come in the room and see how everything works. The staff members are always so kind to our visitors. And, they are patient with all my picture taking! Many of them read the blog, so they know that I have to document everything so I can share it with all of you. I love how Clay was literally surrounded by friends and family when he laid down for the last treatment. Watch the video below. Listen as Natalie says, “It’s going on for the last time, Mr. Furlow.” And, notice the song in the background. There was a lot of commotion when we were walking in, so Clay said, “I’ll be fine to just listen to the Message. You don’t have to plug my phone in.” So, we get into the room…he’s laying down on that table…and of all the songs that the Message plays on a daily basis, listen to what was on! “You’re a good, good father. It’s who You are. And I’m loved by You. It’s who I am. You are perfect in all of your ways to us…” See, God is always with us. He is in every detail. Every single one. God really ministered to me through that song several weeks before Clay got sick and it has been special to me. So, God just decided to play it on the Message for us at exactly the time Clay’s treatment started. Watching the technicians work, is amazing. I’ve been so inspired by all of them. They see their work as a ministry and they fully understand the importance of every detail. Their work has added significant time to Clay’s life, but more importantly, the way they have treated us and cared for us, has made a difference in my entire family. Sickness is hard. There is no way around it. But, when you are loved by your caregivers, it gets much easier to manage. 15 minutes passed quick and it was time to go get him. And, because we have amazing support from our church family, there was a little welcoming party waiting for him outside the room! The sign says, “Congratulations Mr. Clay” because it was made by the our kids Sunday School class at church. Imagine all those precious little children making that sign and praying for Clay. They are watching God do great miracles and it is inspiring their faith. Praise God. It’s hard to put into words just how this picture makes me feel. I’ll just let you look at it and imagine how full our cup really is. Below in the top row (and from the video) is Mike, one of the several nurses that took care of Clay the entire time. He was so cool. Always talking to us and the kids. Loving on us constantly. Making us feel special. I wish Deaton, Sarah and Liz Anne could have been there, too, to be in the pics today. We love you, all. And, thank you from the bottom of our hearts for being so wonderful. On the second row of pics below, and all the way to the right, is Jewel. She worked in the office and took care of our insurance. She is very special. Look at that sweet smile! It does really amaze me to see this and remember how much anxiety Clay had in the beginning regarding this mask. We laugh about the Xanex story all the time. (If you didn’t read that blog, you should go back and read it because it’s funny, but it’s also a really great thing that God taught us.) God gave Clay the strength to overcome that fear, and he grew to be totally comfortable in the mask. If we allow Him, God can turn our greatest fears into our greatest triumphs. So, because of some really wonderful people, the day that we had dreaded for several weeks, came and went with celebration rather than tears. If we had been alone Thursday, we would have left that building feeling sad and afraid. But, we didn’t. God sent our family and friends to surround us so we would celebrate His love for us. He caused us to be reminded of Him. To keep our eyes on Him. Not the storm. Not the walls of water on either side. Him. Keep our eyes on Him. Because He is a good father. It’s who He is. My favorite place in the entire world is the beach. God knows this. So, He provided a way for us to spend a few days at the beach before school starts. He used a very dear friend to bless us by offering a condo for the weekend. We didn’t have to think about it long! We said, YES! and jumped in the car. It doesn’t get much better than this. I love these people. So, before you leave, I have to just tell you a quick thing God showed me yesterday. He is so magnificent. Once we got settled at the condo, Clay laid down to sleep for a while and Ben was bouncing off the walls. So, Ben and I walked down to the beach. It had been overcast and rainy, but the sky was clear, so we went down. Ben was in the water and I was just sitting on the sand watching him and thanking God for letting me be in that moment. The sound of the waves can be an amazing stress reliever. I’m kind of day dreaming, and suddenly I realize that there is a very dark storm approaching. It’s hard to capture this with a camera, but I want you to see how there is sunshine to the far right and the storm was like a perfect line. There was such a clear distinction between the pleasant sky on the right and this dark storm on the left. It was a sudden change. When I looked to the left, all I could see for miles was dark clouds. I just knew we would have to go inside. Ben was skim boarding and having such a good time that I was planning to wait to the last second to make him go inside. But the closer the storm got, the more I thought we might be able to just wait it out. So I stayed there. I was still. The wind really started to pick up. I was freezing. But, I just sat in my chair and leaned into the wind a little. It blew hard. It was uncomfortable, but I was able to stand it. Ben acted like nothing was happening. He just continued to play right in front of me. So, the wind blew. The waves were huge. The dark clouds surrounded us. The storm looked like it would last for hours. But we just waited. And suddenly, the sky lightened up. The storm moved past us. The wind calmed down. The air warmed up. The waves settled. And the sky was light again. And, once again, I was at peace. Listening to the sound of the waves, watching my happy little boy and resting in the peace. Who can control the wind and the waves? I know who can. And yesterday afternoon, He spoke to me through the wind and waves. I felt like I was on an island. Like it was just me, God and Ben. I felt like God was literally visible. Like He was up there in that cloud so I could see Him. He was speaking so clearly. When I looked up and suddenly saw that huge, dark cloud, with such a defined beginning, all I could think of was the day we were in Dr. Bruce’s office and he said, “Clay, you have significant abnormalities in your CT Scan.” What? Talk about a sudden storm. Everything changed in that moment. Our storm had a very defined edge. We went from sunny, beautiful weather, to an instant dark cloud. Then, as the storm got closer, and I just sat there, I felt the Lord reminding me of how He has caused us to be still. We have been still this entire time. We have just waited on God to direct our steps and He has. The storm is not comfortable. The wind is cold and the waves are enormous. I would so much rather be sitting on a beach with perfect skies and a very light, warm breeze. But, God is helping us to endure this storm. We are leaning into the wind, but we are not getting blown away. In fact, we are not even getting rained on. I was struck by the fact that Ben just played at the edge of the water the entire time. He was not affected by the storm. He didn’t even really notice it. I’m sitting there with tears running down my cheeks and he is just as happy as he can be. He has no idea that we could have been in danger from the storm, or that his day may have been interrupted by lightening. He just played and was content. That was the Lord’s way of reassuring me that my kids are going to weather this storm with me. No matter what is ahead. No matter what the sunshine brings. They are going to weather this storm with me. They are not going to be adversely affected. I believe that. After the storm passed, Clay, Sam and Grace joined us. We sat for a while and just talked and played. I watched my little family and thanked God for how He is with me in such a tangible way right now. I thanked Him for speaking to me in every moment. I thanked Him for making that storm today just to show me that OUR storm will pass. He moved the heavens for me today. And, look at this beautiful sight…..
That beautiful sky is exactly where that dark cloud was, just a short time before this picture was taken. Look at Clay’s scar – a constant reminder of what the Lord has done. We stood together and saw the sun shine again. 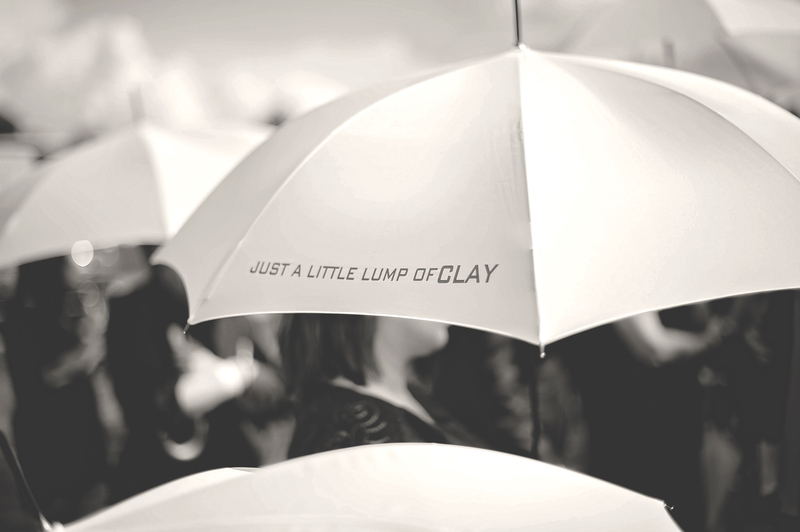 I’m praying that Clay will be with me when this storm passes and our sun shines, again. I’m praying that we will be standing together to see it. But, my trust is in a God who moves the clouds and the waves just for me. So, I know He will be there. And I trust Him. Amen. They shall be abundantly satisfied with the fatness of thy house; And thou wilt make them drink of the river of thy pleasures. For with thee is the fountain of life:In thy light shall we see light. Oh continue thy lovingkindness unto them that know thee, And thy righteousness to the upright in heart. I have been so excited to write this post. I just feel like I could burst wide open because I’m so excited about the things God is doing to constantly remind us that He loves us. There is just so much hope in knowing that our God is loving and He is kind. He wants us to drink of the river of his pleasures and be abundantly satisfied. I always thought that meant a life of pleasure, as we would see it. You know…wealth, health, happiness, contentment, etc. No. That’s not what it means. Verse 7 says that these are people who are taking refuge under His wing, so they are in some kind of need, right? I mean, do you take refuge when you are in a peaceful situation? No. We take refuge when we are hurting, scared, or in need. So, when we take refuge under His wing, then we will be abundantly satisfied and drink from the river of pleasures. What? How can that be? How can a person in need, or in tribulation, or in a fiery trial, have abundant pleasures? I’m here to tell you that it is possible…IF…if you can “see the light”. If you let God open your eyes to see the miracles He is doing all around you in your time of need. If you look. Just look around and SEE all the things He is doing on your behalf as you just tuck yourself away under the shadow of His wing. There are so many stories I could tell you about the past few months that would leave you speechless at what God has done, but there are 3 from the past few days that you just have to hear. This past Friday morning, Clay had just gotten out of the shower and he was sitting on the floor trying to decide if he would actually get dressed. He’s a little slow right now because he’s so tired all the time. And, he’s very nostalgic, so he thinks about people a lot. He looks up at me and says, “I know this is random, but I want to tell you while it is on my mind. I really want to see Kim Dean, Kesleigh Dean and Angie Johnson.” These are three friends that Clay grew up with in church for many years. They were literally in nursery together as babies. They go way back. Kim lives in Baton Rouge. Kesleigh lives in Waco, TX. Angie lives in Dallas, TX. So, you can imagine, I’m standing there thinking, “How in the world am I going to make that happen?? ?” I planned to write them on Facebook and try to coordinate something, but we got busy and I didn’t do anything. The next morning, I had to leave the house a lot earlier than usual to go pick up our daughter at an event. I am not a morning person, so I didn’t want to go. I had even tried to guilt my 17 year old into going for me. And, he would have if I would have really asked him. I was sitting in my room, reading my Bible at about 8:45, and I just felt like I needed to get up and go myself. I got dressed and got in the car. I backed out of the driveway and noticed a girl running on my street. Now, how many times do you see runners in your neighborhood? How many times do you just ignore runners in your neighborhood? Well, for some reason, I thought to myself, “I wonder who that is?” So, when I passed her, I turned around to look at her face. It was Kesleigh Dean….from Waco, TX! I have not met Kesleigh in person before. I have only seen her pictures on Facebook. Several years ago, Kesleigh’s son, Clayton, battled cancer. Clay and I followed her blog and prayed for them constantly. He won his battle and is a vibrant, precious boy. So, Kesleigh has reached out to me several times to encourage me and she has been praying for our family. I’m starring at her like she’s a ghost and I say, “Kesleigh??! !” Yep. It’s Kesleigh Dean. All the way from Waco, TX. And she is running on my street, at the exact time that I’m leaving, when I didn’t even want to be there, and I just happen to look at her face. What?? I’m speechless. Of course, she had time to come see Clay, because God picked her up from Waco and put her on Chaparral Place, all because Clay had a desire in his heart to see her. Isn’t that so sweet? God is so sweet. The Dean’s came that night and we all visited, laughed, prayed and loved on Clay. Angie didn’t make it, but I know God will make a way for Clay to see her, too, because that’s just how things have been working around here. That same afternoon, our dear friends, Robin and Caleb Scherer, came to bring us lunch. Caleb is a really close friend to Clay and he has been very attentive to Clay’s spiritual needs. In a recent visit, we were talking about how Clay’s vision is impaired and he has trouble reading. Reading the Bible has been especially hard because it is so small. Clay picks up the Bible. There are 1900 pages. He puts it on his lap and randomly opens the Bible. He points to a random verse on the random page and starts to read it. Are you ready? Here is is…. Clay looked up at Grace with tears already in his eyes, then he looked at me in amazement, then he just looked back at the Bible and kept reading. We were all very quiet for a minute. God is so sweet. He is just so sweet. Because Caleb was faithful to listen to the Holy Spirit and get Clay the gift, God spoke to Clay in that moment. Be sure to listen to the voice of God in your everyday life. Don’t miss an opportunity to do something He is telling you. You will never know how He can use the smallest gesture to make a huge impact. We will never forget that moment. When Caleb gave Clay the Bible, we were also discussing the idea of listening to the Bible on CD or podcast. A few days before, I had searched for a free podcast and played it for Clay. It was a woman’s voice and he didn’t like it. Right away, he said, “The only way I could listen to the Bible like that would be if James Earl Jones or someone like that did the narration.” I was thinking to myself that it is very unlikely that James Earl Jones ever narrated the Bible for a recording. Well, Caleb had already looked at that and told us that there was, in fact, a James Earl Jones narrated Bible available. So, I logged that away in my “Save This For Later” file and thought that maybe eventually I would try to get that for him. I finish the story and Kenny says, “Don’t leave. I have something I want to give you for Clay.” I can’t even type it. You just have to look at the picture. Y’all. I can’t make this stuff up. It’s real. I promise. Kenny is a pastor, so he can’t lie. 😉 When you see him, ask him if this is true. I just closed my eyes and turned away when he handed it to me. I couldn’t say anything for a minute. He was thinking I was crazy. Then I told him what Clay had said, and we all just smiled and thanked God for His goodness. For His lovingkindness. Let that word really sink in to your mind. LOVINGKINDNESS. His love for us is so strong and He shows it through kindness toward us. These might seem like small things to someone, but to me and my family, these are huge miracles that God has done. He works so hard to show us that He has not left us. While we are in tragedy, He is here in our midst. He didn’t leave. We don’t have to be afraid. He isn’t punishing us. He is using our lives to show the world His love and kindness and greatness. He is faithful and good. We both just looked at each other in amazement and asked her to please thank them. Then, Caleb said, “Well, that’s a great opportunity for us to bless the food and just thank God for all that He’s doing.” So, that’s what we did. We just held hands right there and prayed and thanked God. Whoever you are, thank you. I hope so much that you are reading the blog so that I can say thank you, but if you are not, God saw what you did and He will reward you in such a greater way than I ever could. He will bless you for your kindness and for allowing your life to be used to bless our family. Thank you. Y’all, I have 100 of these stories. Maybe I’ll write a book so you can hear each one and be able to see how God has moved so many mountains already. Maybe James Earl Jones can narrate it for the CD version! Ha! I wanted to tell you these few stories today because I’m praying that your hearts are encouraged and that you close this blog post with a huge smile on your face. God is good. He is loving. He is faithful. His Word is true. He has not left you. No matter where you are right now, or how difficult your circumstance, God has not left. He can see in the dark! He sees you. He loves you. He is with you. And, He is showing you His lovingkindness. If you can’t see it, ask Him to open your eyes. Hide yourself under the shadow of His wing, and He will give you abundant pleasures. I know. It doesn’t make sense. But, it is true. You can walk through the darkest valley of your life with peace in your heart, and joy on your face. You can. Love Him today. Read His Word and let Him speak to you. Hide yourself under His wing. Rejoice in the things He has done and will do. Look for the “little” things He is doing. And, listen to Him when He impresses you to do something for others. Praise God! Praise God! Praise God! He is so good. and thy truth unto the clouds.